Trending at $5.98eBay determines this price through a machine learned model of the product's sale prices within the last 90 days. Platform : Playstation 3. greatest hits, platinum hits, or the player’s choice label. Playstation 2. Playstation 3. Playstation Vita. Condition : New. Nintendo Wii. Nintendo 3DS. Disk is in very good condition 100% tested & working fantastically! Instructions manual & cover artwork are in good condition. May or may not have original case, artwork or manual. In good playable condition. 100% Money Back Guarantee. All items ship Monday - Friday - Fast Shipping in a secure bubble mailer. Virtua Fighter 5 (Sony PlayStation 3, 2007). Condition is Very Good. Shipped with USPS First Class Package. "Take on the world's most elite fighting champions.". Tested; plays and saves. Virtua Fighter 5 V (PlayStation PS3 Game) Brand NEW Black Label Ships Today. Condition is Brand New. Shipped with USPS First Class Package. VIRTUA FIGHTER 5 (with Flaws on Art=Wrinkle). for PlayStation 3. -USED,Complete. The disc is new never moved from its place. the box was opened and resealed. Case, cover art, and manual included. Virtua Fighter 5 (Sony PlayStation 3, 2007). Condition is Very Good. Shipped with USPS First Class Package. Includes game, case and instructions. Please see pictures. Virtua Fighter 5 Sega Sony Playstation 3 PS3 LN perfect condition COMPLETE! Includes case and manual. The disc(s) have a few light scratches. The disc(s) are as good as new. There are no scratches. LIKE NEW condition. THE CONDITION KEY. The disc(s) may have 1 or 2 very small almost invisible scratches. 4 out of 5 stars - Virtua Fighter 5 Sega Sony Playstation 3 PS3 LN perfect condition COMPLETE! 90 product ratings90 product ratings - Virtua Fighter 5 Sega Sony Playstation 3 PS3 LN perfect condition COMPLETE! Virtua Fighter 5 (Sony PlayStation 3, 2007) ​ Complete w/Original Art,Case,Manual Like New Plays perfectly with none to maybe a light mark(s) on discs/No Cracks. Case VG FREE Shipping/Handling USA. Title : Virtua Fighter 5 - Playstation 3. The original artwork is included. The manual may or may not be included. Virtua Fighter 5 - Playstation 3. Title : Virtua Fighter 5 - Playstation 3. Platform : PlayStation 3,PlayStation 3. Condition : Good. Disc have been cleaned. Faint scratches present. Has original case and manual. Tested and Works. Title: Virtua Fighter 5. It is not a picture taken of the exact item being sold. Information about this item. 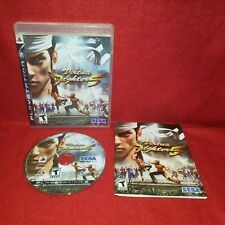 Virtua Fighter 5 (Sony PlayStation 3, 2007) - Japanese Version. Condition is Good. Shipped with USPS First Class Package. This game had been cleaned and tested and works great! It is in like new shape! Fantastic deal!!! Check Back Weekly For New Games! Virtua Fighter 5. PlayStation 3. It is used, but still in very good condition. ES PA NOL : Ud. I personally consider this 'New/Other'. The 1%, usually a fingerprint (which I personally, remove carefully). Trending at $14.82eBay determines this price through a machine learned model of the product's sale prices within the last 90 days. Item is used and in good working condition. Plastic wrap (case) may have stickers and or residue on it from the stickers. See pictures for more details. The booklet is a little bit bent but the game works great. Platform: Playstation 3. If you HAVE. Instruction Booklet/Manual. Both complete with manuals. Virtua Fighter 5 (Sony PlayStation 3, 2007). Condition is Good. Shipped with USPS First Class Package. Complete with Manual. Tested and works perfectly! Legendary Classic! Virtua Fighter 5 test your skills take on the worlds most elite fighting champions.